In my Italian culture, the table has a masculine connotation when is used for various tasks: paying bills, writing personal notes, rest all the groceries that are waiting to be placed in cupboards and fridge. This is the case when the table is called “il tavolo”. A curious thing happens when the table is dressed up for food, meaning for breakfast, lunch or dinner, suddenly it becomes a feminine genre and it is called “la tavola”. This is my observation: In every part of the world, when a woman is invited to go out to a restaurant, she gets well dressed up and prepared for a few hours of fun. Is it for the respect of food, or for the person who invites her, I don’t know…? Perhaps it is only the anticipation of the simple pleasure of tasting food, smelling the aromas and flavors paired with good wines, while resolving life’s problem at the same time. I think that the answers to most questions in life are generally found around a dining table. Ever since Roman times, food have been the special occasion to be invited to, breaking bread with people meant then, as much as it does today, to be trusted enough to be part of the host’s special circle. Even though the Romans ate half laying down on the “triclinium” a type of chase long, their low table in front of them was highly dressed in the fashion of the era and the guests had to appear in elegant attires. Think about the great holidays of the year and how much efforts women take to dress up the table. The purpose of that is to show off the food and enhance the flavor with the decorations on the dining table and all around it. We eat with eyes first; a golden roasted Thanksgiving turkey would not look good if the dining table was not well dressed, right? 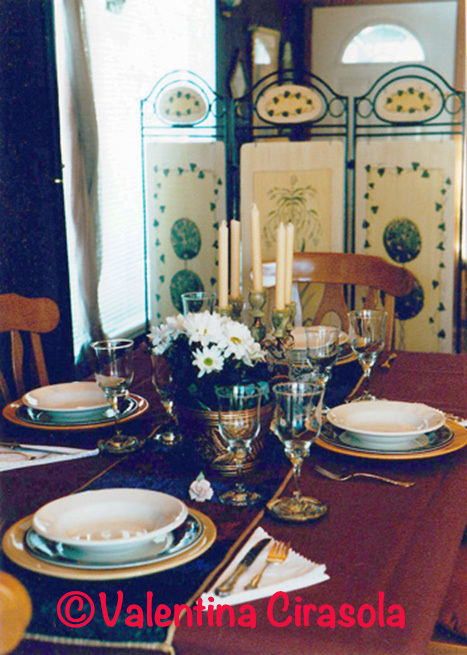 For the holidays, I arrange tablescapes for my Clients and I teach others the secrets of a well balanced decorated table, just so the pleasure of being seated with nice people, eating and conversing can be prolonged well into the day. 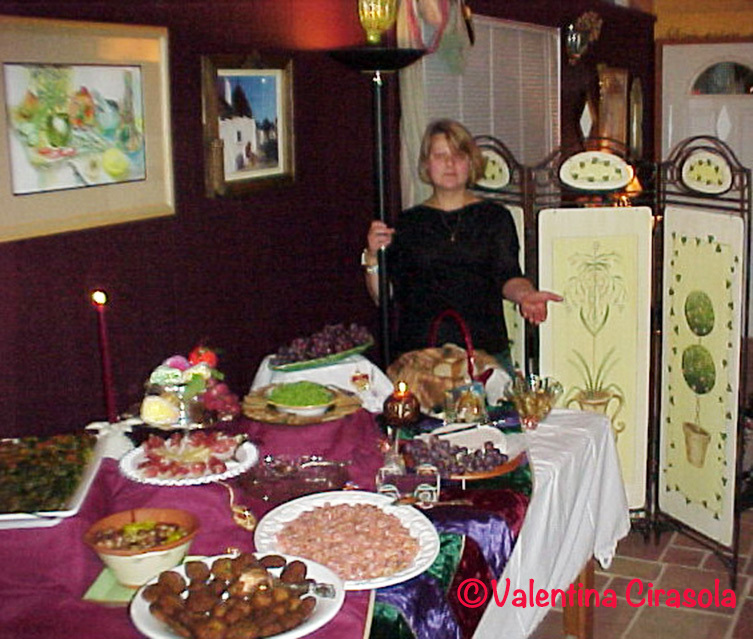 A decorated table also has the property of limiting calories, because it dictates a slow pace of eating, induces conversation, people diverge their attention on life matters and food becomes the way to a general pleasure and not the center of attraction. On the contrary, when people eat away from the table, on their lap by the T.V., on the floor, on the sofa, they tend to eat more and until their favorite show is over, they have ingested an enormous amount of food, damaging themselves day after day. Driving, eating and drinking is the worse, as the attention is somewhere else and not on the road. At night, before I retire into my sleeping quarter, I prepare “la tavola” for the next day breakfast: tablecloth, which changes according to my mood, a scented candle to be turned on in the morning, place settings composed of plates, cutlery, cloth napkins, a coffee cup turned upside down on its saucer and the book I am reading at that time. I want to ease into the morning with a calm and quiet beginning, treating myself to comfort and beauty, accompanied by the sound of classical music and the fresh food I will prepare on the spot. My lunches are always sitting down for about an hour. I never work through lunch, or eat at my computer. Dinners are the delight of my every day, a relaxation time cooking familiar food and enjoying again a dressed up table for the evening. I don’t eat at the Queen’s table everyday, but I want to be the Queen at my table each and every day. It’s the good life! Valentina Cirasola is an Italian Interior and Fashion Designer, working in the USA and Europe. She combines well fashion and interior in any of her design work. She loves to remodel homes and loves to create the unusual. Thank for reminding me of the pleasures in dining at home. Of course Wendy, dining at home is a comforting pleasure.